Melbourne Furniture Removal & Disposal | 1800-GOT-JUNK? Getting rid of old, unwanted furniture can be tough. Items like chairs, sofas, desks, and tables are awkward, heavy, and difficult to move, and even if you do manage to get your old furniture outside, you then need to figure out how to get everything to your local waste management site. Instead of struggling to throw out your old furniture, call us here at 1-800-GOT-JUNK?. We make furniture disposal simple, safe, and hassle-free by coming right to your home or office, loading up all of your junk, and taking everything away for you. Just point and junk disappears! At 1-800-GOT-JUNK? we believe you should only pay for the junk removal services you really need - that's why our furniture disposal fees are volume-based. Simply point out all the furniture and other junk you'd like us to take away. We'll give you a clear, all-inclusive price based on the amount of space your junk will take up in our truck. Our fees cover all the time, labour, fuel, and disposal charges it takes to make your unwanted furniture disappear. That means the price we quote you is the price you'll pay - it's that simple. If you want us to take away furniture that's in good, lightly-used condition, we'll do our very best to find your furniture a new home among our local charitable partners. When you call us, you can feel good about the fact that a needy family may be able to enjoy your unwanted sofa, dresser, or table. In order to qualify for donation to a non-profit organisation, the furniture needs to be clean, functional, and free of bed bugs. Here at 1-800-GOT-JUNK? we take pride in exceeding your expectations about what a furniture disposal company should be. We're happy to help by taking care of all the hard work and heavy lifting that goes along with getting rid of old furnishings, and we'll even sweep up after we're finished. Our crew of two strong, uniformed junk removal experts will take your furniture away from anywhere inside your home, making it easy for you to say goodbye to that huge wardrobe in your bedroom or that massive table in your dining area. We'll work quickly and carefully to protect your walls and flooring against damage while we work, leaving you with a nice junk-free space to enjoy. We know that making time to deal with your unwanted furniture can be difficult, so we offer extended service hours to help make scheduling your junk removal appointment easier. 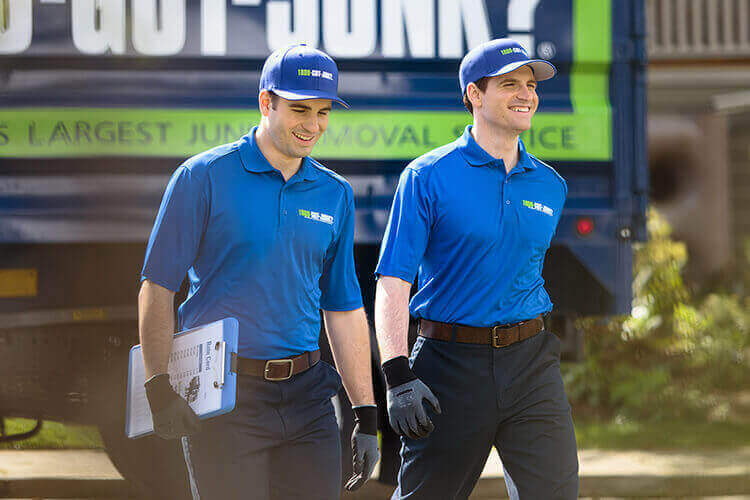 Our team of junk removal experts are available on the evenings and the weekends so you won't have to book time off of work to deal with your junk. If you're dealing with an estate property, chances are good that you're wondering what to do with all the furniture and other junk. Here at 1-800-GOT-JUNK? we provide fast, efficient furniture disposal and junk removal for anyone who is downsizing, dealing with an estate, or simply overwhelmed with too much junk. We're available to take away a single piece of furniture, a complete dining room set, or an entire home filled with furnishing and junk. Just show us what we're up against - we love a challenge! To book our furniture disposal experts, call us at 1-800-GOT-JUNK? or go online today. We're your local Melbourne furniture removal and disposal experts, and we're happy to help you say "Goodbye Junk. Hello Relief."